The Poverty Incidence Map 2012 shows the poverty incidence per municipality in color gradient based on the Estimation of Local Poverty in the Philippines from the National Statistical Coordination Board (NSCB). I am Jessica P. Jimenez from Clarin, Bohol, a Master of Science in Agricultural Engineering student at Central Luzon State University in Muñoz, Nueva Ecija. As a requirement for the Geographic Information System (GIS) subject, I am to produce an Earthquake Vulnerability Map of Bohol. The primary objective of the said requirement is for us to learn and familiarize the functions and uses of the ArcGIS software. 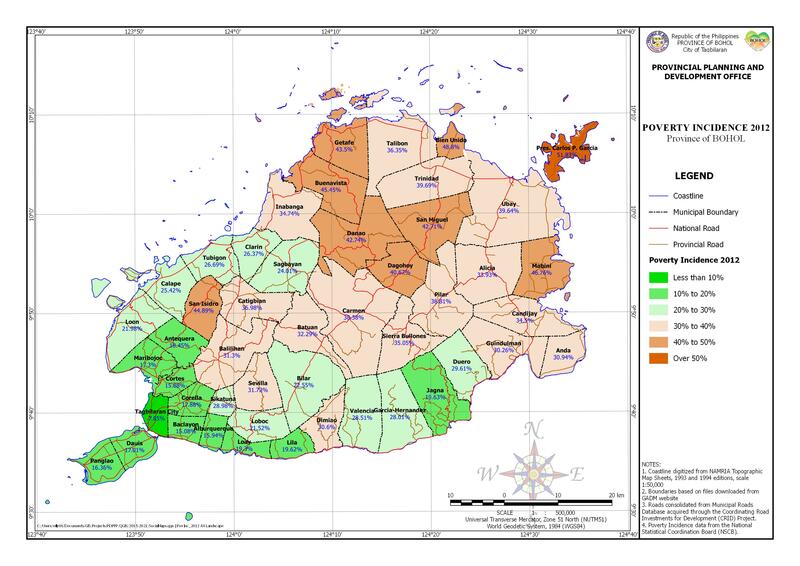 In this connection, is it possible to obtain a Shapefiles of the following: 1) New faultline found in Bohol; 2) Updated Poverty Incidence; and 3) Population Distribution per Municipality. 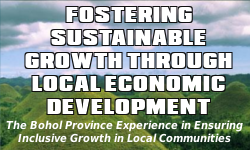 Hi Jessica, thank you for considering your mother province for your case study. As for the data you require, we don’t have an updated faultline delineation, especially the one you might be referring to, the North-East Bohol Fault. Hopefully you understand, it’s not our fault, we just don’t get an update yet from PHIVOLCS. I understand it is also not a quick task for them. With regards to Poverty Incidence, the 2012 data is the latest we can get from NSCB. I’m not sure from what page of the NSCB website, where the data was acquired, but our statistician is on leave for a while and she always told us it can be found at the NSCB website. I hope you can find those data there, or you can just tabulate the data indicated in the Poverty Incidence temporal maps. For population data, you can download them from the Philippine Statistics Authority Website. For other shapefiles you might need, you may navigate through the Shapefiles section under the Bohol Atlas tab, if you haven’t found them already. We hope we’ve been of help for your endeavor.